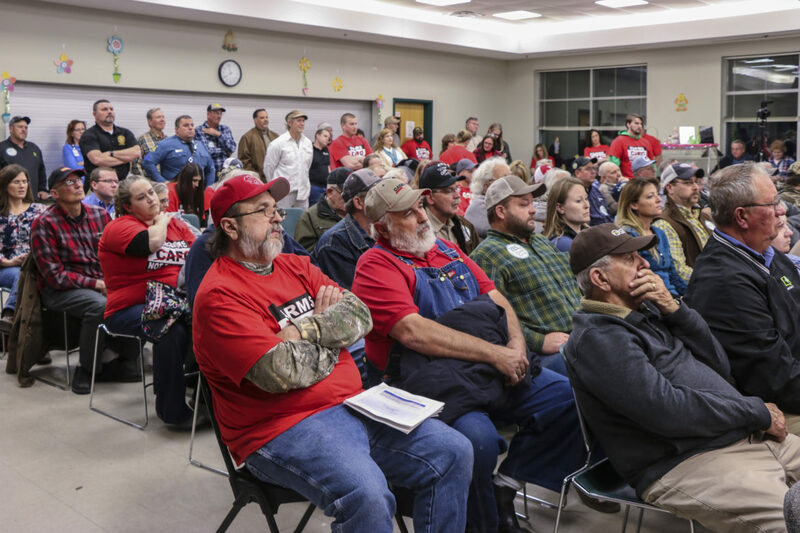 Residents of Johnson County participate in a public hearing at the Warrensburg Community Center in Warrensburg, Missouri on April 3, 2018, many of whom wearing t-shirt with no-CAFO sign on. The meeting was held by Missouri Department of Natural Resources to understand the public’s concerns surrounding issuing permit for the Valley Oaks Steak Company to operate a CAFO in the county. A Missouri state group has delayed expansion of a beef cattle-feed lot in Johnson County, after another state agency granted a permit to do so in June. Valley Oaks Steak Company applied for a permit to expand its 900-cattle feeding operation to just under 7,000 cattle. The Missouri Department of Natural Resources approved the permit on June 15, but neighbors to the proposed project appealed the decision. On July 26, the Missouri Administrative Hearing Commission granted a stay to the petition, meaning the project cannot continue, until a second hearing on August 27, according to KCUR. The original permit was issued to “Country Club Homes, LLC” , which would oversee the expanded operation. The entity does not exist. David Ward, its sole owner, began operating an animal feeding operation in 2016 with 900 cows. Ward admitted he filed a guilty plea in a 2007 case under a separate business for falsifying a form to the Environmental protection Agency over a storm water permit. The company paid a fine of over $90,000. Ward also testified that in 2004, as part of a separate company, he paid a civil penalty of $13,500 for violations of the Missouri Clean Water Law. Valley Oaks’ expansion does not have the capacity to temporarily store manure for the required 180 days in a manure storage shed. At full capacity, the 6,999 beef cattle would produce more than 111,100 tons of manure and urine annually. Under its permit, the only way for the company to be able to the meet the requirement is to store manure in the confinement barn , which would “inevitably spill outside of the open confinement pens” and bury the animals’ only drinking sources. Valley Oaks was not permitted for a partially-completed facility; yet since its permit was approved, the company has added 1,000 more cattle. Additionally, an unnamed waterway runs through the grounds to carry animal waste off the property and into a watershed. And the company did not disclose two fresh-water retention ponds on the property in its site plan. “And its plans for additional construction and additional animals are subject to change at the whim of (David) Ward, a developer who has no experience operating a (Concentrated Animal Feeding Operation). Valley Oaks’ ad hoc approach to running a CAFO without any significant regard for the plans it submitted … only increases the risk of manure reaching the waters of the state." The company had invested $20 million thus far, with plans to spend an additional $10 million and would still need to make payments on a loan as well as potentially lay off 47 employees in the event of a delay. Yet, the commission still found it necessary to halt the project as the "public at large, and the government ... have an interest in protecting water quality and the environment." A message left for comment at Valley Oaks Steak Company was not returned.